MotoCzysz unveiled what may be the most aerodynamically designed motorcycle ever produced … and we’re not just talking about electric bikes here. 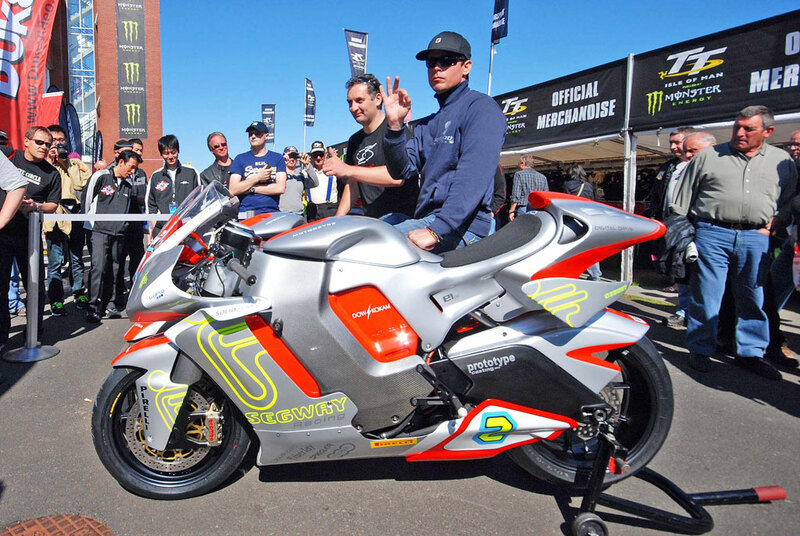 The covers were pulled from the 2012 MotoCzysz E1PC electric race bike ahead of the TT Zero electric race at the Isle of Man, revealing a sleek silver and red sportbike with aerodynamically curving wings and fins. 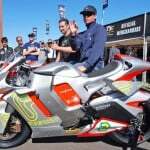 The updated E1PC is MotoCzysz’s latest stab at claiming the 10,000 British pound bounty for being the first electric motorcycle to score an average speed of 100 mph on the Isle of Man’s Mountain Course. MotoCzysz took the last two TT Zero races and is a favorite to do it again this year, but the 100 mph barrier is the bigger goal. 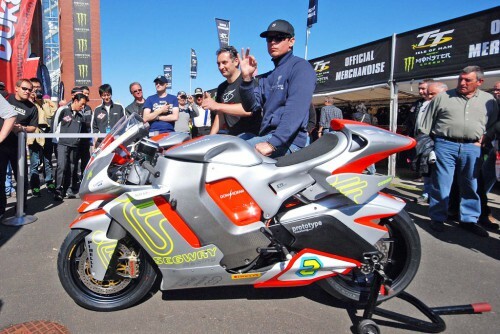 Mark Miller won the 2010 TT Zero with a time of 23:22.89 to average a speed of 96.820 mph, a good 7.53 mph faster than anyone else, and last year, Michael Rutter came agonizingly close to the target speed, averaging 99.604 mph with a 22:43.68 lap time. Looking at the specs sheet, the 2012 MotoCzysz E1PC does not seem that different from the 2011 version. The battery now carries 13.5 kWh of energy compared to 12.5 kWh on the 2011 edition, but the liquid-cooled permanent magnet brushless DC motor still claims about 162 ft-lb. of torque and over 200 hp. The big differences are in the E1PC’s aerodynamics. While the 2011 E1PC had a very minimalist tail, the 2012 version has a large tail section with air ducts and a pair of fins sticking out over the rear wheel. A pair of winglets curl out of the fairing beneath the handlebars, almost like the ones Ducati used on its Desmosedici in 2010, only the E1PC’s wings are higher and much more pronounced. These wings weren’t on Motoczysz’s 2011 TT Zero race bike, but they were on the 2010 model. MotoCzysz founder Michael Czysz explains the decision to focus on the E1PC’s aerodynamics on his blog, explaining the need to focus on improving efficiency rather than continue to boost the race bike’s power figures. “Racing, the automotive industry and the world in general desperately need to recalibrate from using more to using less- more efficiently. Nowhere is this more critical than when creating an electric racing machine,” Czysz writes. We’ll see if the updates help MotoCzysz break the 100 mph barrier and capture a third-consecutive TT Zero on June 6.